earlier in the year i mentioned that i was going to be taking on some freelance writing projects as well as some special projects that hit really close to home. well today i am all jazz-hands-a-blazin' to tell you about one of the special projects and share a little bit of it on the blog. last summer i was asked to collaborate on some marketing materials for alex's school and then to be a part of their capital campaign this spring. well, the work on both projects is now complete and the official capital campaign kicked off this week with the pieces i helped create arriving in homes just yesterday. before i show you the pieces, i thought it might be helpful to give you an idea of what the campaign is all about and in total, what her school is all about. 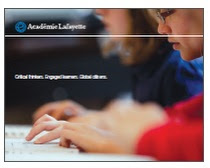 now some of you already know, but for those who don't, alex is a part of academie lafayette - a full french immersion, public, charter school in the heart of kcmo. the following video is one of the most moving and exciting things i have ever been a part of and i just think it's a total masterpiece. it really helps capture the spirit and essence of the educational experience we chose for our daughter. evan has also taken on a piece of the campaign lending several of his weekend hours to leading a group of volunteers in the renovation of the new lower campus that alex will be at for second grade in the fall. and last night we helped to "install" a piece of the campaign at the main campus that will serve as a recognition piece for families. here i am putting up a bunch of sticky tree branches on a wall and there alex is staying up way past her bedtime...for a good cause i might add. pretty sure another one of these puppies is getting the amazon prime treatment and then stuck up on a wall somewhere in our house. i mean, who doesn't need a giant tree on their wall? it's kind of been the year of the trees for us and we're kind of nutso like that, so yeah. i'll be honest and say it wasn't an easy choice when we were moving into the district and trying to decide on school options. we were incredibly skeptical about what we were getting into and whether or not it would be a good choice for her future - but being a part of this campaign and being a part of the day-to-day experience of having a first grader who is fluent in french and is exposed to teachers from all over the world, has been rewarding on a level i can't really even begin to explain. we've gotten involved with several different things and have made some friendships that i already know will last a lifetime. in short: we are over joyed with our decision, extremely proud of our school and super excited to share a few of the pieces from the campaign we helped build. anyway, in the event that you have any further interest in learning about AL or being a part of the campaign, you can learn more (and donate) at www.givetogrow.net. and especially if you live in kansas city, mo and are aware of the urgent need for HIGH quality public education, and you're looking for a shining star to invest in, we can't say enough about our school or the need for helping it grow. now be a good blog follower and go copy/paste/facebook/tweet/google+ that video link all up on the web-sies and help spread the word. merci!